Deer Hunter 2005 Game Review - Download and Play Free Version! Has it been awhile since you've been out in the woods looking for that prize buck? Deer Hunter 2005 gives you that chance again - grab your gear and let's go! A very realistic hunting simulation, Deer Hunter 2005 puts you out in the wilderness with the opportunity to take part in the oldest and most dangerous contest there is - man versus beast. However, there is one difference between you and those who came before: they didn't have high-powered rifles with sniper scopes! Even with all the cool gadgets and gizmo's of the modern hunter at your disposal, your task still won't be an easy one. The deer are elusive and wary, so you'll need your wits about you for a successful hunt! You choose to carry any 2 of 17 weapons, ranging from bows and pistols to shotguns and, of course, rifles! Choose your character and pick his or her strengths - will it be in tracking, calling, stealth, presence, weapons, strength, or some combination thereof? Outfit yourself with a ton of extras - optics, lures, stands, navigation aids, even vehicles! Ride a horse or an ATV, depending on the terrain and your preferences for noise and speed. Deer Hunter 2005 allows you to do everything you can do in real life, and more! With any hunting simulation game, one of the most important aspects to success is a good AI to drive the behavior of the animals. 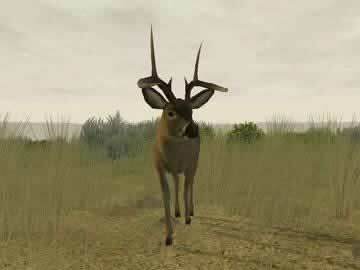 Deer Hunter 2005 delivers on this - you'll be surprised how realistic the 5 different species of deer are! Just like in real life, they have extremely keen senses of sight and smell. If you're not careful, they hear you and escape long before you can see them. If you approach from the wrong direction, they catch your scent on the wind and bolt. Deer Hunter 2005 will put all your hunting knowledge and prowess to the test! Experience the great outdoors like never before! Travel to the dense forests of Germany, the Sky Lakes Wilderness of the Pacific Northwest, and down under to the Australian savannas. Each one of the 6 hunting landscapes is unique and each has its own beautiful scenery. The graphics and sound effects of Deer Hunter 2005 are sharp, clean, and appropriate, allowing you to take your best shot! Take Your Game Online for the Most Intense Hunting Action Around! Things get even more interesting when you play Deer Hunter 2005 against other human players over the Internet. It's the same game, only now you have to compete with other people - keep your eyes on the prize! Deer Hunter 2005 also comes with a menu system that's easy to navigate, which is important when there are so many options to explore. Such a winning combination of great features and realistic gameplay makes Deer Hunter 2005 one of the best hunting simulation games out there. Don't hesitate - when the shot is there, take it! Download Deer Hunter 2005 and nail the big one! Deer Hunter 2005 is an extremely realistic hunting simulation game that is a perfect choice for players who love everything about hunting. You select where and when you want to hunt, as well as the weapons and gear you'll use. You can create your own hunter and improve your skills through bagging better deer. You can even take your skills online and compete against other players. This game has all the elements necessary to create an authentic and entertaining hunting experience. Before you can actually begin hunting in Deer Hunter 2005, you'll need to create a hunter. There are quite a few options available when it comes to customizing. You pick the name, select the look and clothing, and distribute points into various categories that improve your hunter abilities. You can change how well you fire weapons, hide your presence from the deer, track animals, and more. Once you've got a hunter, you can select a location to hunt and the gear you want to use. You'll begin your hunt in that area and can kill and collect (bag) up to three deer. You can bag one doe (adult female deer) and two bucks (adult male deer). Once you've got all three, your hunt is over and you can begin a new hunt. You can hunt alone, or go online and play with others. There are a total of six different locations where you can hunt ranging from the savannahs of Australia to the hills of Germany's Black Forest. While these are large and diverse maps to play, it would have been nice to have a few more options to choose from. When picking a location, you can also select one of four seasons, which will change how effective calls and lures can be. You can change the time of day and weather as well, all of which will affect the appearances and behavior of deer. For example, deer will often be found near water sources later in the day, or out in the open on sunny days. Not only can you hunt in these locations, but there's even an option to observe the deer in these locations, which can give you valuable information. There are three different difficulty levels offered in Deer Hunter 2005. These difficulties give you the ability to find a hunting experience that's right for you. Additionally, there are “exotic” weapons or items that can be used to help you out. 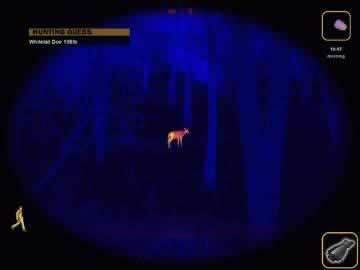 Exotic items like Thermal Scopes can make it far easier to spot deer. For the more skilled and experienced hunters, not using these types of items will earn you higher scores on your hunts. One downside when it comes to difficulty and playing the game is just the amount of time you might need to hunt down and collect all these deer. You'll need a lot of patience to find the best deer or to camp out and lure them to you. 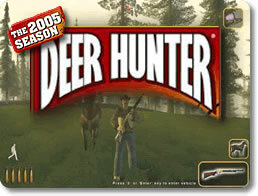 The biggest problem for Deer Hunter 2005 is the total lack of any sort of tutorial or manual. When you first start the game, you're left to basically figure everything out on your own. This can be challenging, especially for people unfamiliar with hunting. While many items have simple descriptions that tell you what they do, they don't tell you how to properly use them. You might see that a certain scent attracts bucks, but no idea when or where to use it. A general hunting guide or tutorial of any kind would have been tremendously helpful. You Have to Follow Hunting Laws ? Another related issue is illegal hunting actions. You are given no warning or information on these beforehand, but actions like shooting a swimming deer or killing too many in a single hunt will turn your hunt into an illegal one that will not reward points or trophies. It's a great realistic touch, but annoying when you aren't aware of it beforehand. Despite the lack of a tutorial, the controls themselves aren't all that complicated (especially for players familiar with first-person shooters). You move with the WASD keys, select weapons or gear with keys 1-10, look around with the mouse, and fire with the Left Mouse button. More advanced controls affect your speed or let you use vehicles. All of the controls are visible and can be changed in the game settings. The presentation is Deer Hunter 2005 is one of the best parts of the game. The deer are detailed and realistic not only in their behavior, but in the way they look as well. The environments, while not as well done as the deer, are still authentic and detailed. The environments are quite large and filled with many kinds of plants and animals (not just deer). Another excellent part of the presentation is a slow motion camera that follows your bullet after a perfect shot to take down a deer. The sounds play their part as well. The animal calls are realistic in their noises, and you can tell when you've messed up a call. You'll hear the sounds of bows and gunshots you fire. You can even hear the sounds of your own footsteps as you hunt. The whole presentation really improves the game and draws you into the action. Overall, Deer Hunter 2005 would be an excellent game for anyone who has a strong interest in hunting. It's an even better choice for players looking for a realistic and authentic hunting experience. You'll get to create your own hunter and improve you skills as you bag bigger and better deer. You can customize a wide array of options to create the perfect hunt for you. You'll be able to take your skills online and compete against other hunters for the best kills. If you're looking for a great hunting simulation game, look no further. Player created video showing some long range shots.